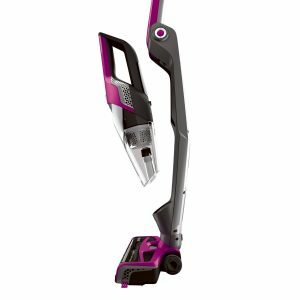 This Bissell model is an easy-to-use cordless vacuum that takes usability to a whole new level. It’s lightweight and versatile and will have you thinking of sweeping your hardwood floors from an entirely different perspective. Thanks to the capabilities of this appliance, you will be able to wrap up your chores in a timely manner. You won’t have to spend a lot of time cleaning litter, sheddings, and any other spills that might have happened or ended up on the floor by accident. Also, this unit comes with swivel steering, which means that you’ll be able to maneuver it as best as possible. The only limitation that has been debated by the people who took the time to review this product deals with the fact that the battery that this unit has been outfitted with can only last for up to twenty minutes. Unfortunately, this is a disadvantage encountered in most cordless electric brooms, which is why you might come to the conclusion that finding a net winner in this sense is next to impossible. Above all, this Bissell electric broom takes the cake when it comes to usability. It’s both lightweight and convenient, and it can be maneuvered with ease. Besides, it seems to be highly recommended for people who own two or even three dogs and let them roam around their living rooms as they deem fit. The unique design makes it possible for this appliance to raise up to par whether you’re interested in dusting or collecting all the sheddings you might have on your bare floors. The ergonomics are another feature that has been praised by most of the people who have bought this Bissell unit. Something that seems to bother most prospective buyers when it comes to owning and using a hefty machine like a traditional vacuum cleaner is that it comes with multiple components that may or may not be difficult to put together. We’ll put your mind at ease as this model can be assembled in a timely fashion especially as the setup process does not require the use of any extra tools. The locking mechanism that this model has been equipped with appears to work very well, at least judging by the owner feedback it has gathered over time. 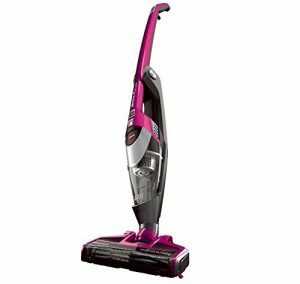 Another factor that you need to consider when buying a cordless vacuum such as this one is whether or not several extras are provided in the deal. Fortunately, we have noticed that this particular model comes with a crevice tool with dusting brush, a pet hair brush roll, as well as a pet hair nozzle tool. Besides, you’ll have no trouble detaching the hand vacuum that’s integrated into the design of the main unit and use it for small surfaces that might be out of reach for the full-size model. Plus, there’s nothing stopping you from using this hand vac for the interior of your car.